These are some of the new papers from the Basics collections. 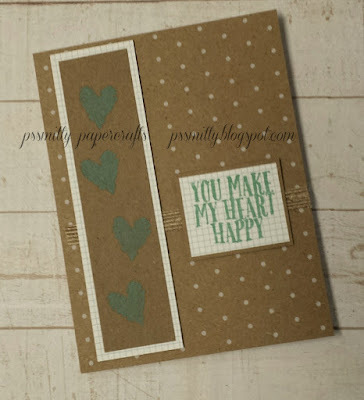 Today I am playing with the new Sea Glass pigment ink and the Happy Heart stamp set. This is an A size stamp set so that means it's only $6.95. There are 3 sentiments and 2 sizes of hearts. So lots of possibilities! TIP: Stamping with pigment ink is a little different with each paper type you stamp on. When stamped on White Daisy CS your stamp will be a tiny bit slippery so be sure you take care to avoid smearing the ink. There will also be a little bit of waiting time for the ink to dry. When stamping on the B&T paper the drying time is very short, and when stamping on Kraft CS the ink dries instantly! AHSC # 174 - Sunflower! Atlantic Hearts Sketch Challenge # 173 - Hello!